Dr Christopher Wiley has written programme notes for the BBC Symphony Orchestra and Chorus concert at The Barbican, London (pictured) on Thursday 15 November 2018. 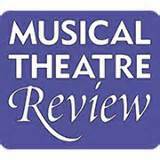 Dr Wiley contributed programme notes for Ethel Smyth’s Mass in D as well as a biographical profile of the composer. Dr Wiley previously wrote programme notes for a BBC Proms concert featuring Smyth’s music in August of this year. The concert presented Smyth’s Mass in D alongside Tchaikovsky’s Piano Concerto No.1 (original version). Dr Christopher Wiley acted as host and interviewer for a pre-concert talk for the Royal Philharmonic Orchestra in the Glass Room studio theatre at G Live, Guildford on Friday 7 April 2017. 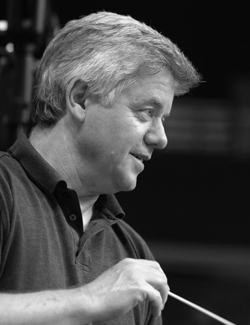 Dr Wiley provided a brief introduction to the programme to be performed that evening, before interviewing the conductor, Barry Wordsworth (pictured), whose many career highlights include long-standing associations with the Royal Ballet and the BBC Concert Orchestra, as well as conducting the Last Night of the Proms in 1993. Over 100 audience members were present for the half-hour talk, which preceded a concert whose programme included Sibelius’s Karelia Suite, Rachmaninov’s Piano Concerto No. 1 in F# minor (with soloist Natasha Paremski), and Tchaikovsky’s Swan Lake Suite, the latter specially compiled from the full ballet by Barry Wordsworth himself. Dr Wiley has previously hosted pre-concert talks for the Royal Philharmonic Orchestra at G Live in 2015, 2014, and 2013. 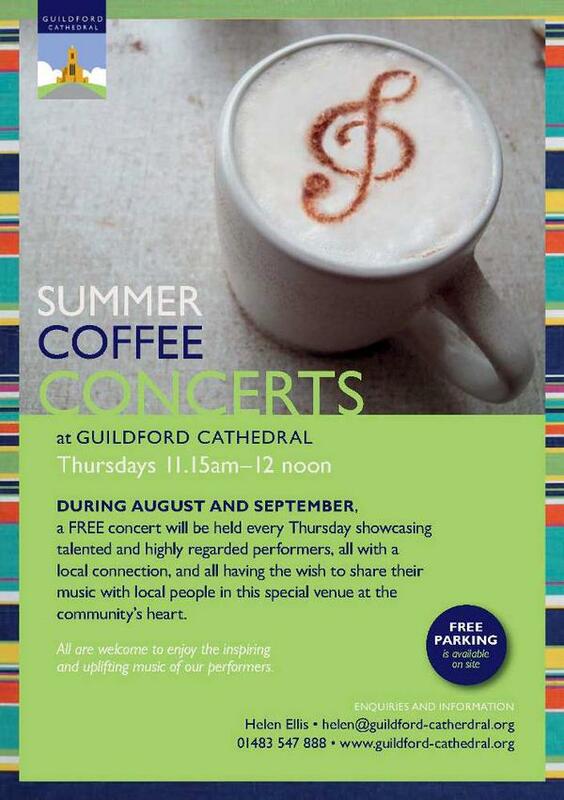 Dr Christopher Wiley performed in a recital at Guildford Cathedral as part of its 2015 series of Summer Coffee Concerts, attended by a diverse audience of around 100. 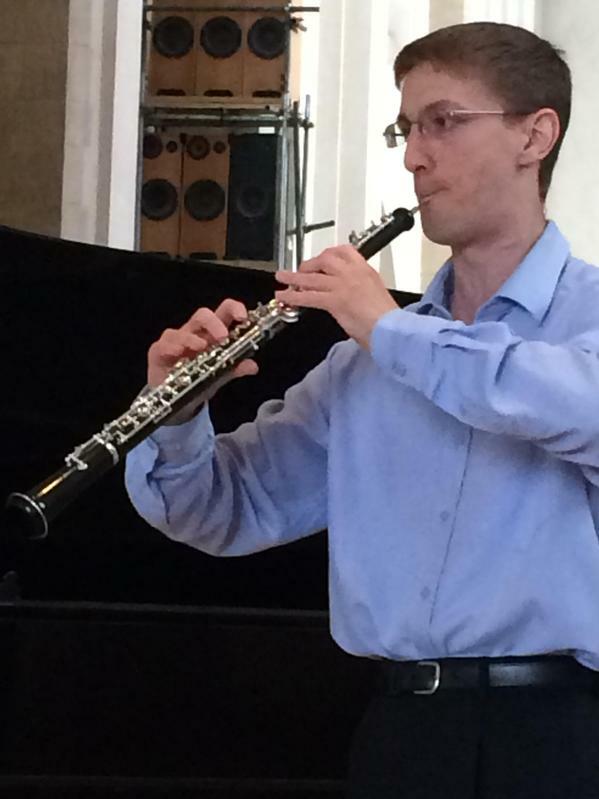 Dr Wiley played Handel’s oboe sonata in G minor, HW364a and Saint-Saëns’s oboe sonata, Op. 166, as well as Madeleine Dring’s ‘Romance’ from Three-Piece Suite. The recital was given jointly with Polish clarinettist Łukasz Jakimów, who performed Burgmüller’s Duo, Op. 13 and Debussy’s Première Rhapsodie. Both soloists were accompanied by Margaret Ozanne (piano). Dr Christopher Wiley hosted a pre-concert talk for the Royal Philharmonic Orchestra in the Glass Room at G Live, Guildford on 15 May 2015. 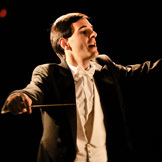 In the half-hour talk, Dr Wiley provided a brief introduction to the works being performed that evening, which he then discussed with the conductor for the concert, Andrew Greenwood (pictured). The Royal Philharmonic Orchestra’s programme comprised Rossini’s The Barber of Seville Overture; Mozart’s Piano Concerto No. 21 in C major, K. 467 (with soloist Tom Poster); and Dvořák’s Symphony No. 9 in E minor, Op. 95, ‘From the New World’. With over 90 members in the audience for the talk, G Live’s studio theatre was at capacity. Dr Wiley previously hosted pre-concert talks for the Royal Philharmonic Orchestra on 23 October 2013 and 7 November 2014. Dr Christopher Wiley hosted a pre-concert talk for the Royal Philharmonic Orchestra in the studio theatre at G Live, Guildford on 7 November 2014. Dr Wiley opened by providing a brief introduction to the repertoire being presented that evening, before engaging in some lively discussion with the conductor, Eduardo Portal (pictured). The Royal Philharmonic Orchestra’s all-Beethoven programme featured the Coriolan Overture, Piano Concerto No. 2 (with soloist Joaquín Achúcarro), and the ‘Pastoral’ Symphony. The 25-minute pre-concert talk was attended by approximately 80 concert-goers. Dr Wiley previously hosted a pre-concert talk for the Royal Philharmonic Orchestra on 23 October 2013 (see here).